One day to go till R+T Expo! 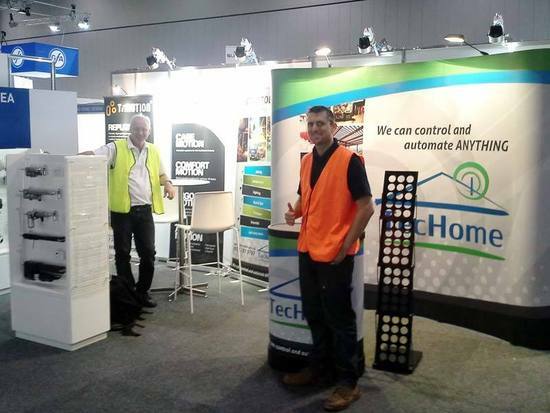 The TecHome team have arrived in Melbourne for the R+T Expo and have been busy all day setting up our stand and getting it ready for opening day tomorrow. We’re looking forward to meeting lots of new customers, and catching up with some of our existing customers as well! If you’re involved in any of these industries or the related motors and electronics market you can’t afford to miss this pioneering industry event. We’ll also be launching our partnership with TiMotion, manufacturer of linear actuators and integrated control systems. We’re proud to be an official distributor of TiMotion products and will be showcasing an extensive range of their products at the expo. A fantastic program of information sessions will also be held over the three days, designed to update building industry professionals on the latest trends in specialist building systems. Our very own Managing Director, Mark Steiner, will be speaking on Thursday at 3pm about the pros and cons of purchasing/manufacturing offshore. There’s plenty to see and do, so come down and see the TecHome team at stand # E33, opposite the café (nice and handy), at the R+T Expo at the Melbourne Convention and Exhibition Centre.